For the past several months, I’ve been learning Apple’s Swift language and how to build iOS apps. Learning this has been something I’ve wanted to do for a while, so it’s been both a fun and rewarding challenge. 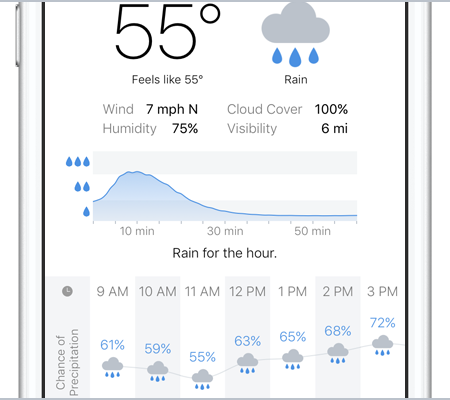 To bring together everything I’ve learned, I built a weather app—not because the App Store doesn’t already have enough of them but because the apps I like don’t do exactly what I want them to do. So I made my own because now I can. 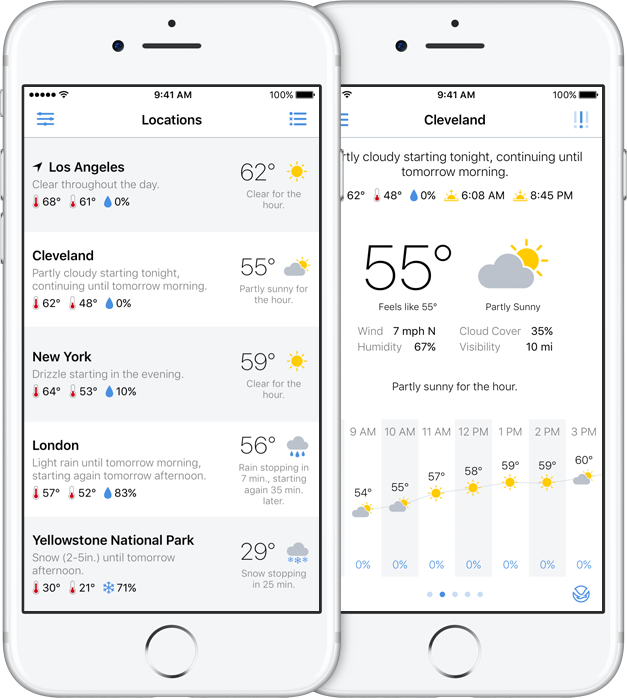 Partly Sunny shows your weather in quick glances and detailed looks. Quick glances of what’s happening in the sky at your current location and your favorite locations. Detailed looks at what’s happening throughout the hour, the day, and the week at your locations. Swipe up in location view to show a day-by-day graph with the week’s high and low temperatures plotted. 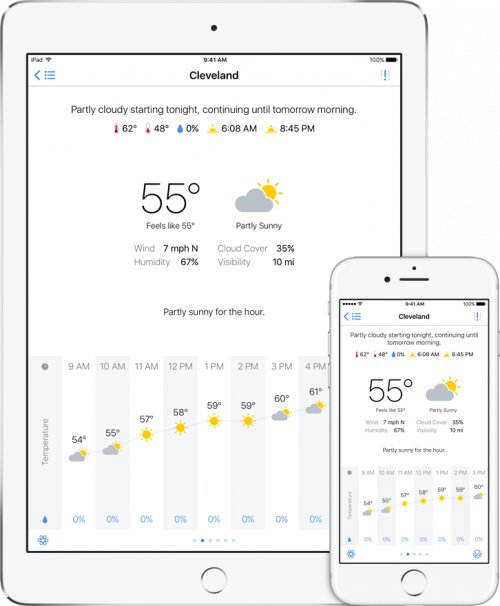 On the day-by-day graph, tap any day to see a detailed forecast for that day. Partly Sunny runs natively on both devices. 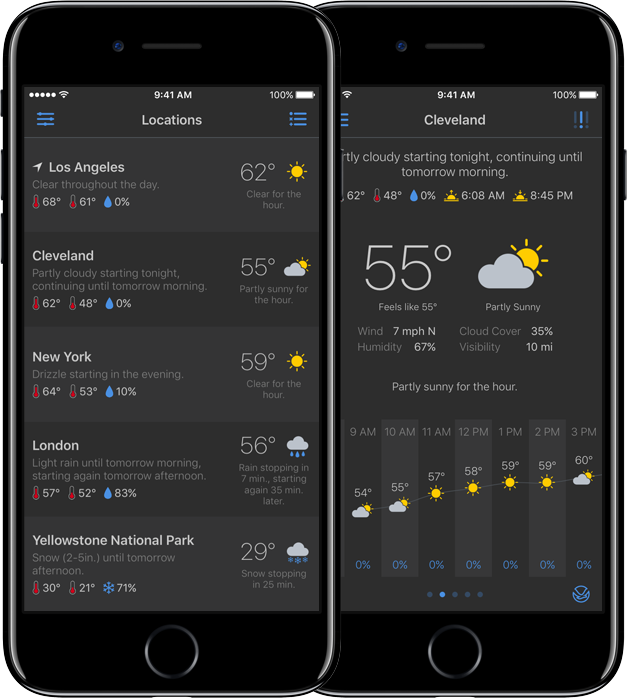 Toggle between Partly Sunny’s light theme and dark theme in the app’s settings or with a handy gesture. 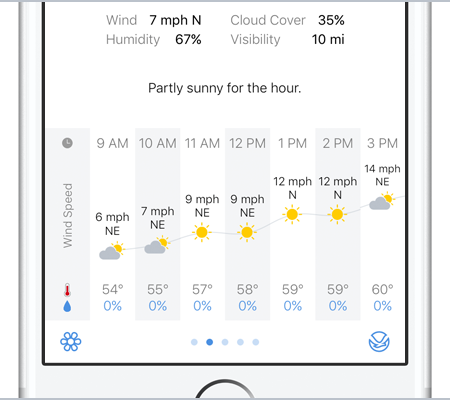 Tap on any hour-by-hour graph and choose to plot temperature, chance of precipitation, cloud cover, humidity, wind speed, or more. For U.S. & U.K. locations, a rain-intensity graph for the next hour will appear when it’s raining. For U.S. locations, links will appear for pollen forecasts and the local NOAA weather office for winter-weather predictions, tropical forecasts, marine forecasts, and more. 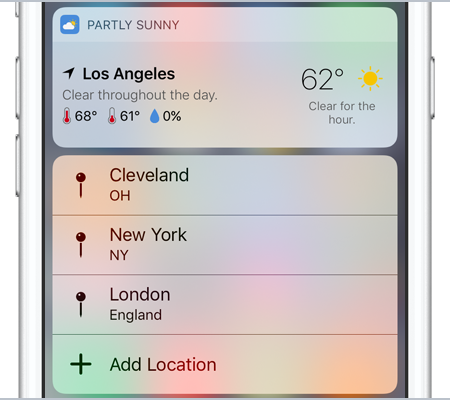 Partly Sunny includes a widget to show both a quick glance and a detailed look at your current location’s forecast. 3D Touch the app icon for the widget and shortcuts. 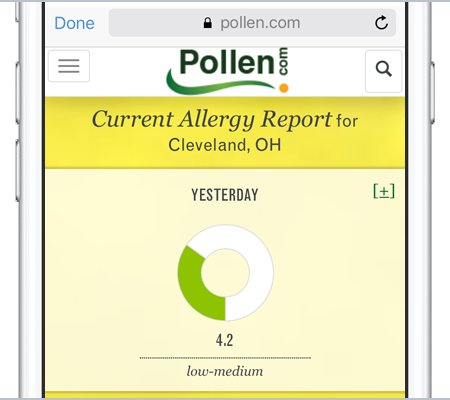 Peek and Pop in the locations list; the location view’s severe-weather alerts, pollen-forecast, and NOAA buttons; and the day-by-day graph. 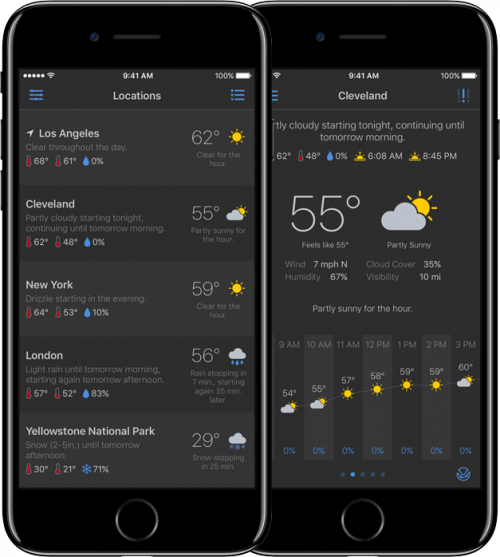 Partly Sunny forecasts are powered by Dark Sky to give you super-accurate data. While you may not always enjoy the weather, hopefully you enjoy checking the weather with Partly Sunny. Of course there are things I want to tweak and more features I want to add, but I’m proud of what I’ve accomplished so far. I set out to do a thing, and I did it. You can visit Partly Sunny on the web at partlysunnyapp.com and follow @partlysunnyapp on Twitter. 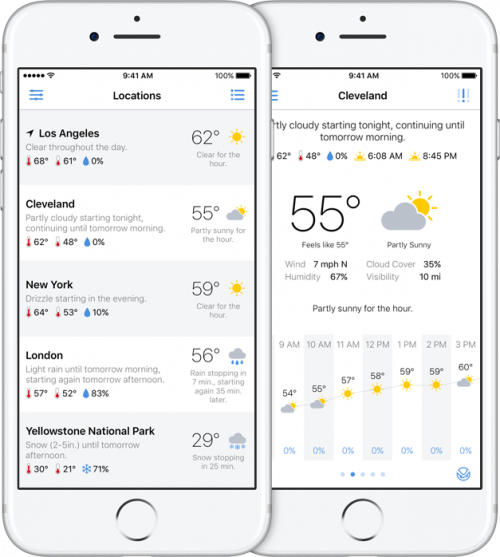 Partly Sunny will be available on the App Store tomorrow is available on the App Store for $2.99.